This was a really fun project. I built it all night long. I went to bed at 4 in the morning that night. The wood is a South American wood. There is only a clear coat. No stain. Beautiful dark wood. We went with a very modern look by going with a shorter headboard at on 45 inches and metal legs gives that pro look. Next project on the list is a pair of nightstands. I do not stain too many things as I prefer the natural color usually. So is that a glued up head board? There’s nothing like getting eight hours of sleep on an eight hour bed. It’s a nice bed and it turned out beautifully. Yeah, it was nice to get it all done sure wish that I had the mattress to sleep on that night; I probably would have slept on it haha. Yes, the wood is actually left over from a door project and I actually glued up small pieces. If you look close there are some small pieces glued in. I am surprised how strong it is. I am glad that it is cause its also used as the legs. 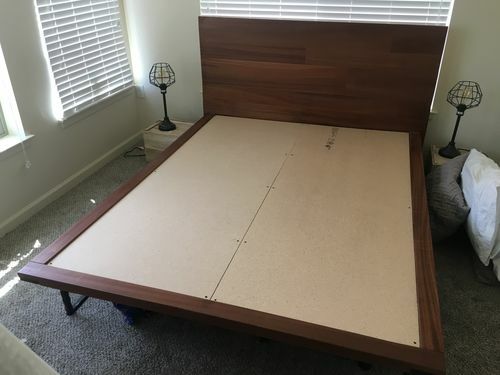 You bed looks great. I would like to see some pics without the mattress. Here it is, I pulled off the mattress just for you. Thanks! Looks really great! I appreciate you taking this pic for me.